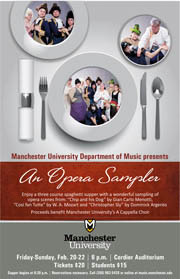 Manchester University’s Department of Music offers an Opera Sampler the evenings of Feb. 20-22. A three-course spaghetti supper features performances from operas, including “Chip and His Dog” by Gian Carlo Menotti, “Cosi fan Tutte” by Wolfgang Amadeus Mozart and “Christopher Sly” by Dominick Argento. The performances will take place in Cordier Auditorium on the North Manchester campus. Tickets are $20 for adults and $15 for students. Doors open at 6 p.m. and the meal is served at 6:30 p.m. Call Bethany Biggs at 260-982-5426 by Friday, Feb. 20, to reserve a seat. Reservations are necessary. All proceeds benefit the Manchester University A Cappella Choir.